Via a participant-observer approach, Synagogue Life analyzes the three essential dimensions of synagogue life: the houses of prayer, study, and assembly. In each Heilman documents the rich detail of the synagogue experience while articulating the social and cultural drama inherent in them. He illustrates how people come to the synagogue not only for spiritual purposes but also to find out where and how they fit into life in the neighborhood in which they share.In his new introduction, Heilman discusses what led him to write this book and the process of personal transformation through which he, as an Orthodox Jew, had to go in order to turn a disciplined eye on the world from which he came. Rather than using the stranger-as-native approach of classic anthropology, he had instead to begin as a native who discoverd how to look at a once-taken-for-granted synagogue life like a stranger. In the afterword, arguing for the efficacy of this approach, Heilman offers guidance on how natives can use their special familiarity and still be trained to distance themselves from their own group, making use of the disciplines of sociology and anthropology. 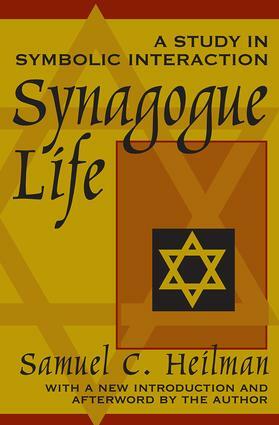 Synagogue Life offers a fascinating portrait that has something to say to social scientists as well as all those curious about what happens in the main arena of Orthodox Jewish community life.